OSAKA — In late January, Mount Shinmoe, one of a cluster of volcanoes on a mountain range straddling Kagoshima and Miyazaki prefectures, woke back up. Known among James Bond fans as the site of the secret rocket base in “You Only Live Twice,” Mount Shinmoe had been quiet for more than half a century, but its most recent eruptions sent plumes of ash, gas and debris into the atmosphere and shattered windows 8 km away. Volcanoes in fact can be found from Hokkaido all the way to the Ryukyu islands, making the Japanese archipelago one of the world’s most volcanically active. Is Mount Shinmoe in danger of a massive eruption soon? A lava dome is growing in its 1,421-meter-high crater, but as of late February it was not certain whether a single, massive eruption would occur. Its most recent outbursts have varied in size, and such activity could continue for a long period of time. Mount Shinmoe’s last major eruptive episode began in 1716 and lasted for 1 1/2 years. Are there other volcanoes in danger of erupting? There are 108 active volcanoes on, or under, the seabed near Japan’s four main islands. Thirteen have been classified by the Geological Society of Japan as Class A volcanoes — those exhibiting the highest level of activity. That doesn’t mean an eruption is imminent. It only means the odds of one happening are greater in comparison with other officially designated volcanoes. How often do Japan’s volcanoes erupt? Some, like Mount Nigorigawa in southern Hokkaido, haven’t done anything since at least the Pleistocene epoch ended about 12,000 years ago. Others, like Mount Fuji, which last erupted in 1707, have been quiet for hundreds of years. But 34 volcanoes went off in the 20th century, and since 2000 there have already been a dozen eruptions. What are the most powerful and destructive volcanic eruptions ever recorded in Japan? In 1792, Mount Unzen, another Kyushu volcano situated near Shimabara, Nagasaki Prefecture, erupted. The volcano and a resulting tsunami killed around 15,000 people. But an even more powerful volcano in the Kikai Caldera, a series of underwater volcanoes off the island’s southern coast, erupted between 8,000 and 9,000 years ago. Known as the Akahoya eruption, it discharged an estimated 150 cu. km of lava and ash that reached southern Kyushu, causing massive environmental destruction. What other recent eruptions have occurred? Mount Unzen was particularly active in the 1990s. In June 1991, a large eruption occurred after six months of smaller blasts, sending lava flows 4.5 km from the crater and killing 43 people. Over the next three years, another 10,000 smaller eruptions that caused lava flows were recorded, although none as powerful as the June 1991 pyroclastic blast. By 1995, the eruptions had come to an end. In July 2000, the 813-meter Mount Oyoma on Miyakejima Island began erupting. All 3,800 of the island’s residents were evacuated, and they were not allowed to return to live there until early 2005. A less severe eruption of 2,565-meter Mount Asama, between Gunma and Nagano prefectures, took place in February 2009. Smoke billowed more than 2,000 meters into the air and rocks were thrown more than a kilometer from the crater. Ash fell as far as central Tokyo. Sakurajima, a former island volcano in Kyushu that became physically connected with the Osumi Peninsula thanks to lava from the 1914 eruption, can stay active for days, threatening the nearby city of Kagoshima. Of the 108 volcanoes, the Meteorological Agency continuously monitors 30 of the most active. This includes taking seismic, infrasonic, visual and geodetic observations. Microphones to record infrasonic sound and cameras are installed at each monitoring station. The collected data are transmitted to four Volcano Observation and Information Centers in Sapporo, Sendai, Tokyo and Fukuoka. When a volcano erupts, how are warnings issued? There are five different levels of official volcanic activity alerts issued by the Meteorological Agency. Level One is normal and applies to the area around the crater. At this level, gas emissions may occasionally pose a threat to life, and hikers and climbers will sometimes be advised to avoid the crater area. Evacuation is not necessary. Level Two means the area around the crater is closed to the public. Level Three indicates that the volcano zone has been closed off. Residents are advised to stand by, and the elderly and disabled should prepare to evacuate. This advisory applies to the crater and surrounding nonresidential areas. Level Four means residents should prepare to evacuate because severe eruptions are likely that may damage residential areas. The elderly and disabled are evacuated. Level Five means a severe eruption is imminent and residents should evacuate the danger zone. 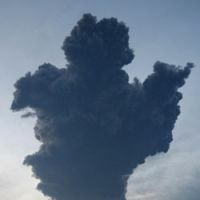 The Volcanic Observations and Information Center issues these threat level warnings to the Japan Coast Guard, the police, local meteorological agencies and NTT Corp. The coast guard is responsible for notifying all vessels, while the police, the meteorological observatories and NTT notify municipalities, which then advise the public what steps to take. In small towns or remote villages, this can mean going door to door or driving around with a loudspeaker. NHK also gets volcanic warnings from the center and broadcasts them on television and radio. If a volcano erupts near where I live, what should I do? Check with your local government office to determine what measures will be necessary, and make sure you know where designated evacuation zones or relief centers are. Large cities and many prefectures have foreign-language information available on where to go and what to do, but most small towns do not.